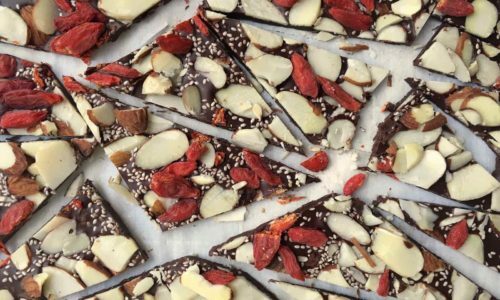 Chocolate bark is a holiday season favorite, and one of the best things about it is it’s so easy to make in so many different ways. You can add different nuts, seeds, and dried fruits (as well as many unhealthy things like candy and Oreo chunks, but we wouldn’t recommend it). This approach is about as healthy as it gets, since it’s packed with crunchy superfoods, but it also works because it has a ton of different textures. Plus, it’s really colorful and will look super pretty on your favorite platter (and on Instagram, obviously). On a parchment lined baking sheet, pile the chocolate chips and set in oven for about 2-4 minutes. As soon as the chocolate has softened slightly, remove it from the oven. Using a spatula, spread the chocolate out until about ⅛ inch thick. Sprinkle on the coffee grounds, toasted almonds, goji berries, chopped pistachios, chia seeds, and finish with flaky sea salt. Slide the chocolate with the parchment onto a cool counter to harden. Let set for one hour or more if needed. You can also the chocolate set in refrigerator. Once chocolate has hardened, cut into random shapes with a sharp knife. Be sure it’s cooled and hardened completely before storing. Dessert that’s filled with superfoods? Yeah, we’re into that. Dark chocolate is incredibly nutritious on its own due to its high flavanol content. Goji berries are antioxidant-rich; chia seeds contain protein and healthy fats. The bark is also gluten-free, unlike many of the other cookies you’re likely to make around the holiday season.